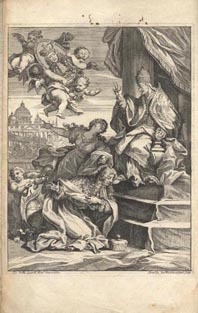 Wright (1617-94) was an English Catholic with strong Scottish connections who, after many years of Continental exile, joined the court of King James VII and II as a painter. The high point of Wright's career was his appointment as "steward" (in fact as Master of Ceremonies) to Lord Castlemaine's embassy to Rome. 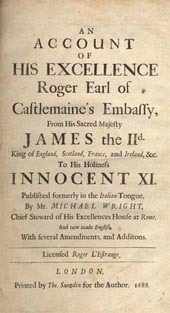 The publication of this work, with its inflammatory frontispiece, at London in January 1688, was an action of supreme tactlessness which greatly undermined the credibility of the king as England and Scotland moved towards revolution.